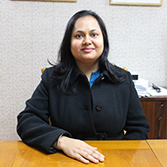 Mrs. Roopali Singhal is the Head for the Corporate and Commercial Team at Krida Legal. She is an expert in Corporate laws and is instrumental in incorporating companies, societies, trusts et al. for our clientele. Besides being a lawyer, Roopali is a qualified Company Secretary. She regularly advices clients on Corporate structuring and restructuring, Mergers & Acquisitions, Joint Ventures, issues relating to FERA/FEMA, Debts and Equities, Start-Ups, One Person Company etc. Roopali has an eye for Art and Paintings and often discusses the works and painters with our Art and Cultural Property clientele.